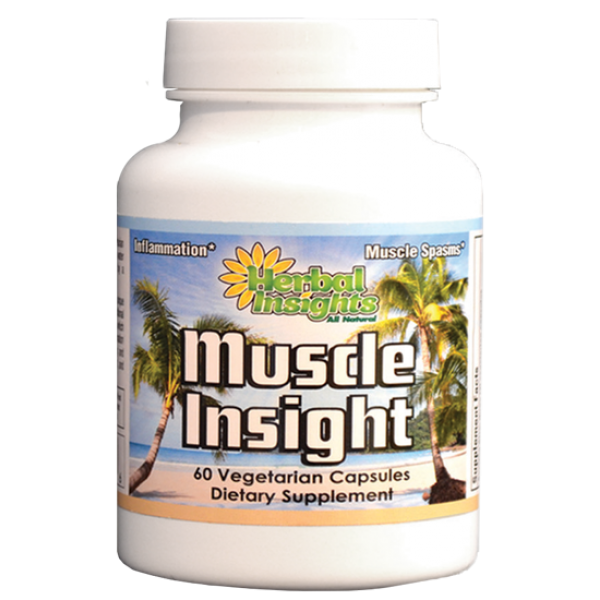 Muscle Insight is a unique formulation for minor muscle spasms and inflammation associated with low back aches, foot cramps, or calf cramps. It may help headaches and minor pre-menstrual cramping. If taken before or just after exercise you will not feel as sore as if you did not take Muscle Insight. The remedy is designed to correct the problem so you don’t have to take the formulation forever to keep working. Recommended dosages are: 3 pills 2 times daily between meals with water. It is possible to use different dosages based on certain circumstances;. During an injury or just after an injury, it is okay to take 3-4 capsules two times per day, or even 3 times in a day, after a few days you should go back to the recommended dosages. A person who is not injured, but has aches and mild pains from daily activities can take 1-3 capsules, 1-2 times per day. A person with no pain can take Muscle Insight as well. It is best to lower the dosage, and use it to prevent muscle spasms and cramping. Recommended dosage for prevention is 1-2 capsules, 1 time per day. Muscle Insight may help with mild low back pain, muscle cramping, foot, toe, or calf cramps, and mild premenstrual cramping and aches. It may help with chronic shoulder tightness or mild muscle pains. Occasionally, it may help with headaches and eye pain. When Muscle Insight is taken just before, during, or just after exercise, there is a strong possibility a person will not get as sore as they normally would without taking it. Muscle Insight may help knee pain associated with inflammation. Muscle Insight may also help with low energy. Muscle Insight helps by regulating the body's natural blood flow and restoring certain electrolytes lost during rigorous or mild exercise. It also helps by reducing inflammation in the body that has accumulated in a certain area. If you are pregnant or nursing, you should not take this supplement. It is best to consult with your physician. Muscle Insight is not a replacement for any medical condition and it is always best to consult with your physician before taking any supplements.